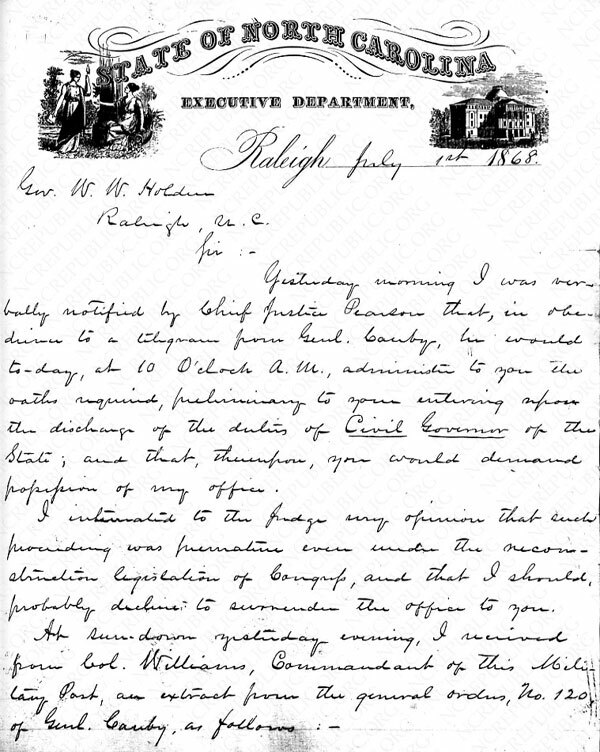 This is the letter of surrender written by Governor Jonathan Worth to Governor W.W. Holden, after being informed of the Military's intent to execute General Order 120. 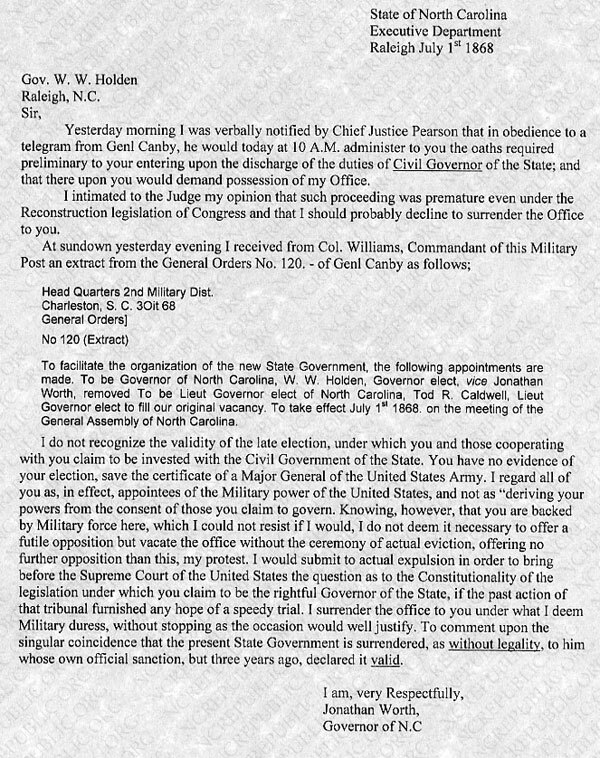 The letter includes an excerpt of General Order 120 and Governor Worth's protest to the actions intended. Yesterday morning I was verbally notified by Chief Justice Pearson that in obedience to a telegram from Genl Canby, he would today at 10 A.M. administer to you the oaths required preliminary to your entering upon the discharge of the duties of Civil Governor of the State; and that there upon you would demand possession of my Office. I intimated to the Judge my opinion that such proceeding was premature even under the Reconstruction legislation of Congress and that I should probably decline to surrender the Office to you. Head Quarters 2nd Military Dist. To facilitate the organization of the new State Government, the following appointments are made. To be Governor of North Carolina, W. W. Holden, Governor elect, vice Jonathan Worth, removed To be Lieut Governor elect of North Carolina, Tod R. Caldwell, Lieut Governor elect to fill our original vacancy. To take effect July 1st 1868. on the meeting of the General Assembly of North Carolina. I do not recognize the validity of the late election, under which you and those cooperating with you claim to be invested with the Civil Government of the State. You have no evidence of your election, save the certificate of a Major General of the United States Army. I regard all of you as, in effect, appointees of the Military power of the United States, and not as deriving your powers from the consent of those you claim to govern. Knowing, however, that you are backed by Military force here, which I could not resist if I would, I do not deem it necessary to offer a futile opposition but vacate the office without the ceremony of actual eviction, offering no further opposition than this, my protest. I would submit to actual expulsion in order to bring before the Supreme Court of the United States the question as to the Constitutionality of the legislation under which you claim to be the rightful Governor of the State, if the past action of that tribunal furnished any hope of a speedy trial. I surrender the office to you under what I deem Military duress, without stopping as the occasion would well justify. To comment upon the singular coincidence that the present State Government is surrendered, as without legality, to him whose own official sanction, but three years ago, declared it valid.